Our most common specialty trip during the winter months (November - March) is what we call our Sailfish excursion. We fish an area called "Sailfish Alley" during this time of the year which lies between Boynton Beach and goes north on up and into the next county. For these trips we usually book a six to eight hour day which gives us around an hour to catch live bait and the rest of the day to locate and catch fish. It is possible to purchase bait from a local bait boat which does allow for more fishing time. The average cost for live bait is around $60 a dozen and we usually recommend about eighteen pieces of bait per trip. These trips can offer great excitement with usually big fish and we tend to scale down our tackle to mainly 20# outfits. Pricing for this trip is based on our normal hourly rate, plus bait if required. Interested in tangling with a Shark? Be careful of what you wish for. We mainly target big Bull Sharks which have the highest testosterone known in the animal kingdom. Typical fights can last from 30 minutes to over an hour and a half. Bull Sharks are mean, large and very aggressive fighters. The average size fish is between 200 to 400 pounds. We do not boat or bring back big sharks to the dock but we will get them along side the boat for great photo opportunities before the release. Come battle one of the kings of the sea! 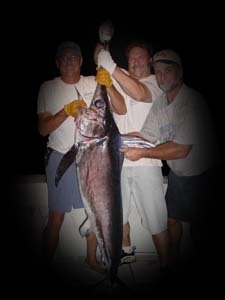 South East Florida offers a very realistic chance of tangling with the king of the ocean - the mighty Swordfish. No other game fish around the world can compare to an angry hooked sword during the middle of the night. 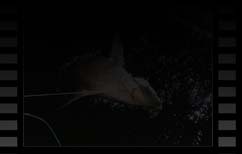 Swordfish adventures are nighttime fishing trips and consist of an eight hour trip. Depending on the time of the year and a variety of other factors, this trip is usually scheduled between four in the afternoon to midnight. Pricing for this trip is $1200 and there is a maximum capacity of three (3) fishing guests. We now offer a daytime sword fishing adventure! This trip offers the best of both worlds by including a sport fishing troll out to the swordfish grounds along with the swordfish deep drop. This trip is usually scheduled from 8am-4pm and consists of approximately a 3hr troll out to the fishing grounds in search of Dolphin (mahi), Tuna, Wahoo or Sailfish, among other species. This is followed by a 4hr Swordfish drop in prime daytime swordfish locations. We use heavy electric reels for this part of the trip. 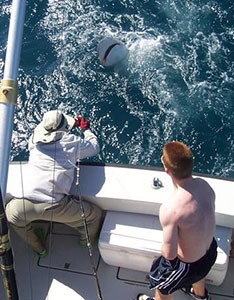 Even though electric reels are used, a swordfish hooked in the daytime provides spectacular visual enjoyment with wild fights and awesome jumps. 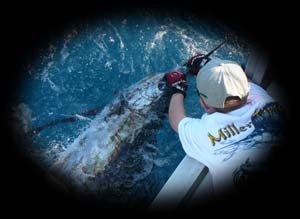 Pricing for this trip is $1200 and there is a maximum capacity of six (6) fishing guests. This is a summer time and fall favorite. A four or six hour trip priced at the normal hourly rate, to one of the many lively local Boynton Beach area reefs. This trip is designed for the bottom fishing enthusiast, in which we anchor up and deploy chum throughout the water column to entice mainly Yellowtail, Mangrove and Mutton Snapper. Other bottom dwelling species can be caught doing this method to include Grouper, Kingfish, Triggerfish, Bonita along with a host of other species. There is a maximum capacity of three fishermen during these trips.